It's happened again. Periodically, and it's not often, but often enough to be memorable, Windows Update decides to reset the settings from "Download updates but let me choose whether to install them" to "Install Updates Automatically (recommended)." Yes, I understand the risks; Microsoft may have detected a flaw that needs urgent patching. My machine is vulnerable until I get around to launching the update. But what I'm consciously trading off is productivity. What's lost is a complex desktop of settings --with Office applications, browser windows and specialized applications in particular states not easily reconstructed. It takes 30-45 minutes to restore the desktop back to something resembling its previous state -- and sometimes that isn't feasible due to the dynamic nature of the applications and associated web content. When researching this on previous occasions, I recall that Microsoft insisted that users must have been changing other settings. This was certainly not the case here. And there was no message from Windows Update to be responded to, and the machine was left in an idle state overnight. No scripts were scheduled. There should have been little unscheduled activity other than backup scripts running on servers, and those backup scripts do not touch local drives. I acknowledge that Windows Update is a complex beast and that sorting out dependencies and update sequencing is anything but trivial. Based on previous responses, I don't expect a solution, only denials. But I thought I'd post this message so that you know you're not imagining that the settings "changed themselves" again. 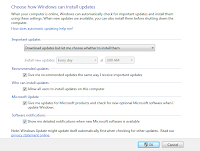 24-MAR-2011 Happened again on today's updates to Windows 2008 Standard. Wish it was illegal for MS to change settings. I too keep having to go back in and change the automatic update thing, after having to do a system restore because so many things quit working. Class action suit anyone? 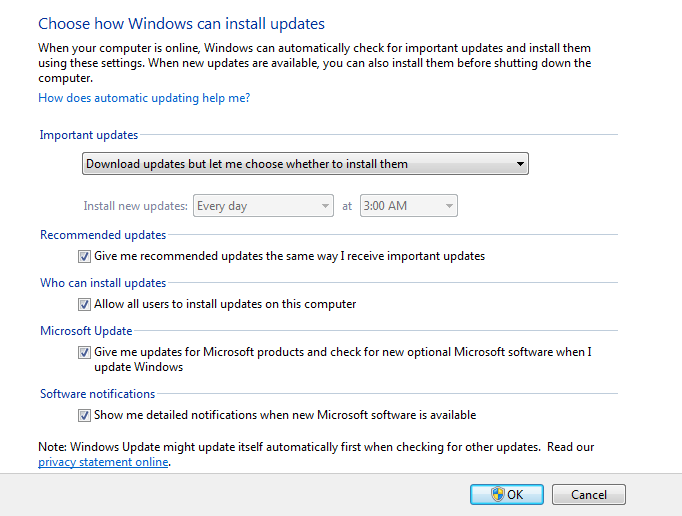 I wish it were illegal for MS to change settings regarding updates. I keep changing mine, and updates happen anyway, one of which is changing my settings for updates. Class action suit maybe? Wow! I have the same problem and it seems that it is happening with my "new Wn7" installations and not my older ones. I hope Microsoft offers patch soon because it is driving me crazy! I do not want Automatic installation because it causes disk failures and corrupted files because you never know when is installing and you can put the laptop in sleep mode or even force power down and everything goes bad. I am one of the few people who never has issues with windows and it is because of this - NEVER AUTOMATIC. Microsoft - can you please fix this. Happens to me as well. And I really don't like it. Sometimes I even get updates I never would have installed. Does anyone have any idea why this is happening? This is an incredible violation. Happens to me too. Also my User Account Setting(UAC) is changed at the exact same time the update settings are! microsoft hijacked my windows update settings set at never check and changed it to install everything and bricked a $600 dollar laptop also distroyed the bios. Totally distroyed the laptop i am so f mad.